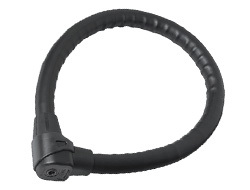 The Steel-O-Flex series are renowned in the bicyucle world as being a top rating cable lock. Theives are detered simply by the sight of one since they know it is a hassle to cut or saw. The lock is Sold Secure rated to Gold and includes a special ABUS Plus mechanism which cannot be picked. It is one of few locks in the world to be manufactured by ABUS in Germany. The cable itself is made using unique high-tensile 25mm hardened shells. 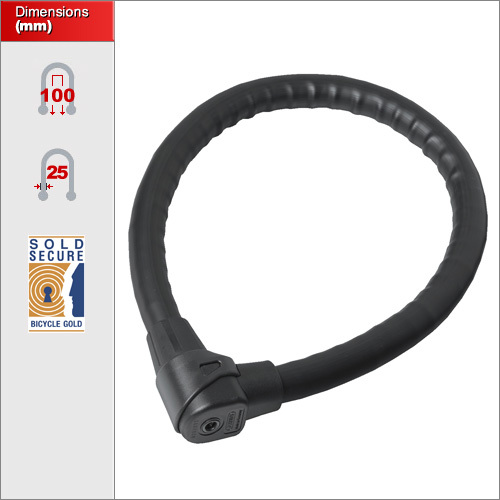 There is only one size in the Steel-O-Flex which is 1100cm long with a 25mm cable diameter. Insurance approved for bicycles but also a great light-weight option for motorbikes.